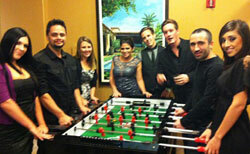 Foosball tables are a staple in any man’s hangout. It’s a fun game that brings out a person’s competitive nature. At a bar, foosball tables are the center of friendly competition. 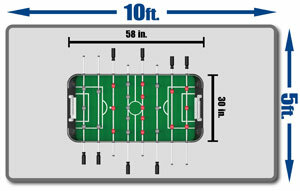 Similar to soccer, the game of foosball involves kicking a small ball past your rival’s controls and into the goal. Unlike soccer, the ball is controlled by little men attached to a rotating rod. The game requires great dexterity and skill, making it a popular game amongst men everywhere. It’s easy to learn and enjoy, allowing new and experienced players to challenge one another to an intense tournament. While most guys go out to play the game, there are a number of affordable tables available for playing at home. They make a great addition to any man cave and come in a variety of styles to suit any space. Not every foosball table is made the same. Before you go out and invest in the first table you see, it’s a good idea to know how tables stack up and what to look for. 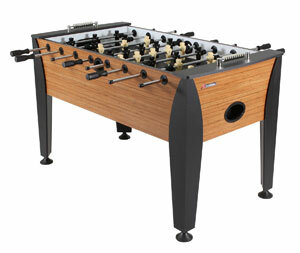 This table is a top-of-the-line model built with professional playing in mind. It is a full-sized table with a mahogany melamine finish. The legs can be adjusted to get a perfectly level playing surface. Hollow steel rods are smooth and fast, allowing you to make fast shots and get past your opponent’s block. The grips of the rods are made from SureGrip plastic for a comfortable and tight hold. It is a hefty table made for serious playing. This 46-inch long table from Hathaway is beautifully designed to fit into any game room. It is made from a wood grain MDF and chrome accents. Levelers on the legs make it easy to set up the table. Chrome cup holders and a traditional scorekeeping system give the table a classic and refined look. The rods are made from solid steel and have smooth bearings for a better playing experience. It contains a single goalie configuration and counter-weighted men. The table is moderately priced and built very well. 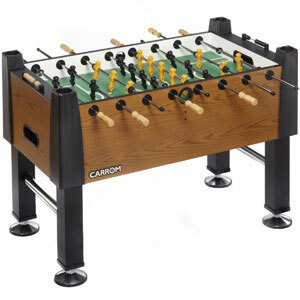 This foosball table from Carrom measures 55 inches in length. The surface is .375 inches thick and is screen printed with enamel for a superior finish and smooth playing. Levelers on the legs and a cross support underneath the table surface keeps everything level. The counter-weighted men have a wider foot for improved accuracy. You can play with an interchangeable one or three goalie pattern. The rods are made of hollow steel and have a detailed wood handle for grip. Coming in a variety of colors and finishes, you can easily find an option for your space. 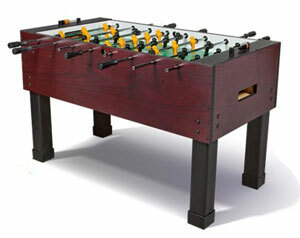 On the lower end of the price spectrum is the Atomic Pro Force foosball table. It is a full-sized table made from MDF and steel. The 1/2-inch table surface is solid and smooth for intense gameplay. There’s a built-in ball return and entry point for quick replays. In terms of design, the table is very sleek and modern. The bamboo laminate siding and black legs are attractive and complementary to many spaces. 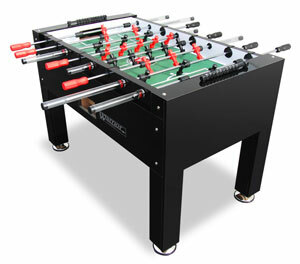 The Warrior Professional foosball table is a unique and versatile option. It is made from durable MDF and has a simple black design. Levelers create a fair game space while a smooth surface allows you to make fast shots. The rods have a special guard that makes the game perfect for kids. 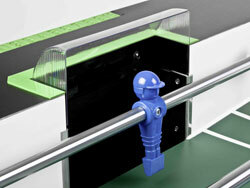 The guards prevent the rods from extending too far out of the table, avoiding potentially dangerous accidents. It’s a high-quality table that’s easy to assemble and start playing in no time. This budget option from Hathaway is perfect for children and adults alike. It is smaller than a standard table, measuring only 40 inches in length. However, the small size makes it perfect for apartments and smaller game rooms. The MDF is covered in edgy graphics on the sides and surface of the table. Hollow steel rods hold 13 ABS men per player. It has three goalies for quick and easy playing. Rubber handles improve grip and prevent discomfort. At just over $100, it’s an excellent option for those on a budget. This affordable option from Playcraft Sport is an eye-catching option that saves money and space. At only 48 inches in length, the table is small enough to fit in smaller rooms, yet big enough to deliver an authentic foosball experience. It is made primarily of composite material. Plastic corner caps keep the table safe while adding structural integrity. Chromium steel rods have slide bearings to provide smooth action. There’s also a ball return and levelers. Stunning graphics on the unified legs and side panels appeal to players of all ages. 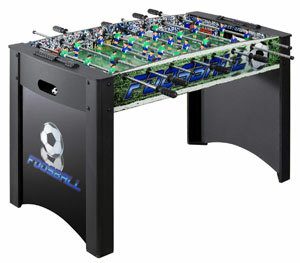 Foosball tables come with a load of features that set them apart. When you’re looking for that perfect table, there are a number of things to consider. The features of the table will directly affect the price, so it’s important to consider which features you need to have a great playing experience. Size is an important factor. While they may look compact, you need ample space on all sides of the table for movement of the rods and the players. A full sized table measures 56 inches long and 30 inches wide. However, you should plan for several extra feet of space around it. Smaller tables are available, but some may find the playing experience a bit more uncomfortable than they are used to. The way the goalies are configured can change the way you play. Some tables are set up with three men guarding the goals while others have only one. The difference in the two types of configuration is playing style and skill. Tables with three goalies are best for kids and new players. The three men make it easier to block the opponent’s shots. It’s also great for those who want quick games that are fun and easy to play. On the other hand, single goalies are great for experienced players. Controlling a single goalie takes a lot of skill and concentration. These games are harder and tend to take more time. In the end, it’s just a matter of personal preference. Many manufacturers make both options and have rods that you can change. If you want to play like the pros, go for counter-weighted men. Essentially, the little men on the rods have a weight on them that keeps them upright. 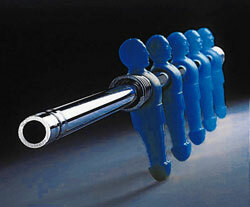 Not only will it make the men stand up after releasing the rod, but it gives you a bit more power when you take a shot. Non-weighted men often get in the way, making players fumble to straighten them out when they need them most. Chances are, your floors aren’t perfectly level. A leaning floor or table gives an unfair advantage to one player. Levelers work by changing the height of each leg by tiny increments. A level indicator located on the table will make it easy to get the perfect level. The quality of the rods can subtly effect how you play. Cheaper rods made of plastic are incredibly easy to break. Rods get a lot of action. 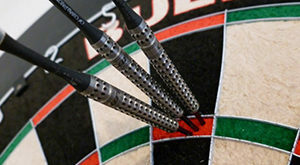 Most players push and pull them with a lot of force due to the adrenaline, causing plastic rods to break. Steel rods are made to last. They have smooth action and can withstand anything you put it through. Steel rods can either be solid or hollow. Solid rods are heftier and can be great for aggressive players. Hollow rods are generally considered to be the best because they are light and move fast. 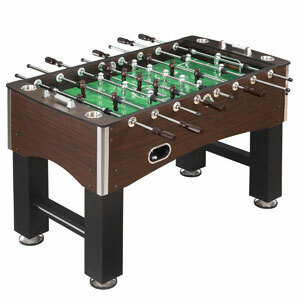 Foosball tables vary in price because of construction. High-quality tables are made from solid wood. The hard material makes the table heavy and durable. However, wood can warp and deteriorate in quality if not taken care of. Humid environments may cause the wood to warp and affect gameplay. Particleboard tables are the cheapest out there. Particle board is very easy to damage and degrades over time. In fact, the material is known to fall apart in just a few years. Composite material is often used for mid-range tables. It’s a tough material and can actually withstand more than solid wood. It is not susceptible to damage from humidity. Therefore, it is capable of lasting much longer with proper care. When it comes to the surface of the table, there are a few things to look for. The first thing is how hard and smooth it is. A smooth surface like solid wood has the least friction. This allows your ball to speed around the board. 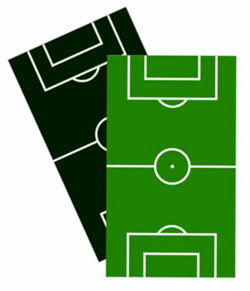 Surface markings should be smooth and laminated to the board. A sticker will only hinder the ball. Not only can it slow the ball down, but stickers can curl up over time and require replacement. 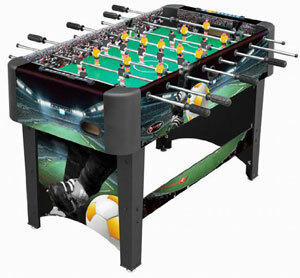 Unbeknownst to many, there are a few different types of foosball tables available. The way the table is built can affect how you play it and the space it takes up. Knowing what type of table you need for your playing style and game room can make it easy to choose the perfect option. If you’re looking for a classic table to fit in your game room or man cave, a standard foosball table may be the way to go. These tables are the same kind that are generally found in arcades and pubs. While they do come in a variety of sizes, you’ll mainly find full-sized options. These tables are quite heavy and built to last. Most manufacturers construct them of solid wood. They can withstand a ton of wear and tear, providing you with years of competitive play. Some are even made to last in outdoor areas. Standard tables are generally considered to be the best option because of the superior build and design. They usually look fantastic and last a lifetime. If you want a top of the line table, go for a standard, full-size option. 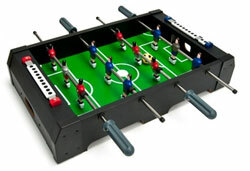 If you’re tight on space, a tabletop foosball table is a great option. They are versatile in both size and price. 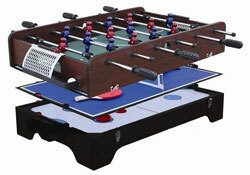 Often considered “mini” tables, they allow you to play the game without taking up a ton of space. In fact, many owners store the tables away when not in use. They should be placed on a sturdy surface. Because they don’t have legs, they aren’t made for playing directly on the floor. They’re a great option for kids, as the smaller size makes it easier to learn and master the game before upgrading. The tables and parts are often made of durable plastic, which also helps to drive down the price. Overall, these tables are an affordable option for casual players. If you plan on playing on a regular basis, this may not be the best option for you. However, the price point and small footprint do make it an affordable addition to any game room. Combination tables can be the ultimate game center for your space. These tables are exactly what the name implies: a combination of multiple games in a single table. Usually, these tables are full-sized. The construction varies from manufacturer to manufacturer, but they generally look like standalone foosball tables. Games are changed by switching out the tops. Some tops come off completely while others are attached and require you to flip the entire table over. Either way, combination game tables can include a variety of different games. Air hockey, ping pong, and billiards are commonly included on these combination tables. A table can vary dramatically in price based on the number of games included, the size, and the material it’s made of. High-quality materials are often used, as these tables do experience some wear and tear through switching out the game top. If you want a full game room without paying for multiple pieces, a combination game table is right for you.